COLUMBUS –St. Ignatius advanced to the state hockey championship game with a 5-1 win over University in the semifinals of the state high school Frozen Four this morning here in Nationwide Arena. The Wildcats (30-7-3) will play the winner of this afternoon’s Dublin Coffman-Sylvania Northview winner at noon tomorrow here. It is the first appearance in the title game for Iggy since 2000, the year the school won its only state title in hockey. The Wildcats made their big move in the first minute of the first period when they blitzed for a pair of goals to turn the corner, taking a 3-1 lead. First, sophomore Paddy Spellacy scored his 42nd goal of the season at 0:30 to make it 2-1. Spellacy took the puck in the neutral zone after it was cleared by John Jeziorowski and the US defenders were not able to get back quick enough, Spellacy using his speed to beat Prepper all-league goalie Jamie Regan and score the goal. Then Chris Knoth put a check on US sophomore Matt Wipper that appeared to be a clean hit, but he must have just released the puck as Knoth was charge with roughing, putting the Preppers into their second power play of the morning. Wipper was hit so hard that he had to leave the ice at 0:47 of the second. The hit and Knoth’s two minutes in the sin bin worked in the Wildcats’ favor. They put the special teams to work with Asa Frebes took it down and scored the shorthand goal at 0:57. Frebes took a pass from Nolan Schade and again used speed to score for the one-minute two-for. The Cats special teams unit then killed the rest of the US power play. The Peppers (22-11-2) had another power play late in the second period, but Iggy killed it and then capitalized a minute later scoring once again to make it 4-1 to skate off with the three goal lead and the third set of15 on the clock left to play. Mike Wells cleared the puck. It was picked up by Liam Geither, who sent a cross pass to Jeziorowski, who scored at 14:25 to make it 4-1. It was Jeziorowski’s 15th goal and 29th point of the season. Geither was credited with his 26th assist. Wipper did return to the ice for the third period although not 100 percent. Mike Wells scored the third period insurance goal off a pass from Geither. US scored first after Spellacy went in the box in the ninth minute of the first period and the Preppers had their first power play. They took advantage of it with a Wipper goal on the power play at 9:06 off a rebound off the pads of Iggy goalie Josh Potts. The Preppers took three shots on Potts and then on the third rebound Wipper scored his 27th goal to make it 1-0. Ian Robertson and Andy Gerow assisted. It was Gerow’s 20th assist of the year. That US lead was short lived as 34 seconds later Jake Riemenschneider scored his 13th goal of the season, a power-play tally off an assist from Spellacy, his 32nd of the season. Riemnenschneider knocked it through the five hole, between the legs of goalie Jamie Regan. Sam Nader also assisted. A US holding penalty put Iggy in the power play to set up the goal. The Wildcats played the first period with Spellacy in the box nearly four minutes on a couple of two-minute minors, one ending early on the US goal. The shots were even, 8-8, in the first period. Iggy had a power play at 3:37 of the first when Wipper went in the box for tripping Jeziorowski. The Cats had several shots on goal but the reliable Regan came up clean each time. Jeziorowski and Nader each had decent shots at Regan, but neither were to go. After the US kill on the penalty, Sam Turben took a hard shot on Potts right off a face off, but the Iggy goalie buried it. CLEVELAND – A Cleveland-area sweep was not to be as ninth-seeded Ohio University came out of nowhere this week to play winning basketball, culminating with an 81-75 overtime victory over Akron in the Mid American Conference championship men’s basketball game tonight here in Gund Arena. It was as if the ghost of Jerry Garcia had resurfaced and his spirit leaped into the souls of the OU players this week so that they could give their fans something to be grateful for and thereby giving the school yet another reason to party. Kent State had already won the regular season championship and Akron was hoping to make it a double-dip for the Portage-Summit corridor, but the Bobcats were not to waste their trip to Cleveland and went home with the first-placed hardware, earning them a trip to the NCAA tournament, The Big Party. It was a tight game all night, the lead changing hands two dozen times along with a dozen ties. Akron led briefly early in the second half, but the Bobcats led most of the half although not by much. Their biggest lead was three points until Armon Bassett gave them a four-point lead on a layup with five and a half minutes to go in the game. Akron then came back and pulled to within one point on three Darryl Roberts baskets. Roberts’ rattlings paved the way for the last minute run in regulation. The Zips had two chances in the final 20 seconds after Roberts came up with a steal on the defensive end with a half minute to go in regulation and then when the full-court press forced an errant OU pass out of bounds. Yet, the Zips failed to take the lead as they could not get off a decent shot against the determined Bobcat defense. Not to give up too easily, the Zips finally caught new life when Steve McNees hit a three-pointer with seven seconds to play in regulation minutes to tie it, 68-68, and send it into overtime. Akron tied it twice in the overtime period including once on another McNees three, but OU led most of the period and was able to hang on for the victory. The Zips would not let the Bobcats open up any sizable lead in the second half. During one three-minute stretch midway through the second half, the lead changed hands seven times. All of the Akron leads in that interval lasted less than a minute. Reggie Keely, a freshman who hails from University Heights and is a Cleveland Heights High alumnus, was the only Cleveland guy in this game. Keely started at forward for the Bobcats and was the club’s top rebounder and defender (in terms of steals) in the game until he ran into foul trouble early in the second half and sat for an extended time as a result of it. Later he picked up his fourth and disappeared from action again. The game was not even eight minutes old and the lead had already changed hands nine times as both clubs traded baskets and threes as neither could carve more than a three-point lead until Roberts sank a 15-footer with 12 minutes to go in the half to give the Zips a five-point edge, 20-15. However, that hardly was a driver to allowing the Zips to zip away quite yet. A couple threes by D. J. Cooper brought the Bobcats back and the lead began changing hands again the rest of the half. A Chris McKnight 18-foot jumper tied it for Akron with 7:50 left in the half, 26-26. An old-fashioned three-point play by Akron’ Jim Conyers was followed by a another Cooper bomb for three to make it a tie at 29, taking the game inside four minutes left in the first half. Cooper’s shot at the halftime buzzer that hit net made it a 36-34 game in favor of OU. In the first half, the game was tied six times and the lead seesawed 14 times. Cooper led all scorers in the first half with 14. Bay Village – Oberlin College scored four times in the third period to knockoff Shenandoah University 7-5 on a wet and rainy Saturday afternoon at Bay Village High School. Sophomore Dylan Holmes spearheaded the Yeomen offense with three goals, while Erik Strand made an impressive return to the team with two scores and 10 groundballs. Oberlin (1-0) led 3-0 before the Hornets (0-5) finally got on the board with 7:54 left in the second period. SU would add another tally to make it a 3-2 game at he break. Holmes cashed in his second goal of the day just minutes into the third period, but the Hornets fought back to tie the game at four with a pair of quick strikes inside the 12-minute mark of the third quarter. The Yeomen would come back with a scoring flurry of their own with two goals in 12 seconds between 5:28 and 5:16 of the third period. The first came on a rifle from the top of the box out of the stick of Strand after he came up a key groundball in the Hornets’ territory. Strand then won the ensuing face-off and marched right down the middle of field to find a wide-open Holmes in front of the cage for an easy score. The Hornets would score just once in the fourth and Oberlin did a good job of possessing ball to salt away the win. The Yeomen out-shot the Hornets 40-17 and won nine of the game’s 16 face-offs. OC was also successful on 30-of-36 clear attempts. Oberlin returns to action on Tuesday night when it plays host to Adrian College. Be sure to check goyeo.com for the latest on where that game will be played. MENTOR – As lacrosse continues to grow as a varsity sport at Mentor High, enough interest has stirred among the girls for assistant coach Amie Balale to have enough depth to field two teams – a varsity and JV unit. “Some of the girls started with us as when we were club team and have moved up since we became a varsity sport.” Balale said. Returning players for the Cardinals are Allison McKendrik JR, letter Alyssa Sebestyen, SR., Andrea Radel, JR, Letter, Ashley CUmberledge JR, Aubrey Baggs, Soph, Brandy Thornton, JR, Brenna Robinson, SOph, Celeste Matthews, JR, Cory Divelbiss, SOPH, Esther Weil, JR, Heather Pearce, JR, Jen Digangi SR, Letter, Jessica Elliott, JR, Katie Gordon, SR, Letter, Kayleigh Saw, SOPH, Kristen Hebebrand, SR, Letter, Lauren Onda, SR, Letter, Liz Smith, Jr. Meaghan McMahon, SOPH, Melody Mansi, SOph, Nicole McDowell, SR, Letter, Steffany Mego SR, Letter, and Taylor Howell, JR.
Incoming players include Brynne Crawley, Catherine Cooper, Delany Imbler, Emma Miller, Lacey Miller, Erin Walsh, Kristyn Vines, Natalie Pachinger, Shannon Flaherty, Stephanie Zook, Tiffany Chandler, Gabby Hastings, Jamie Michaels, Jenn Smith, Jessie Lipstreuer, Kara Drummond, Joan Graziano, Okivia Lazzaro, and Sarah Carter. The Cards are still working on team chemistry, bringing a balance between those with experience and those still new to the game. Balale and Nina Bulzan are new assistant coaches this year while Heather Rosenberger is the new head coach. BEREA, OHIO -- Baldwin-Wallace College track and field senior Greg Patrick (Collins/ Western Reseerve) placed third in the shot put to earn NCAA Division III All-American status today, Saturday, March 13, 2010) at the National Indoor Track & Field Championships at DePauw Universityin Greencastle, Indiana. Patrick threw the shot a school-record fifty-five feet and one-quarter inch on the fifth of his six throws that equates to 16.77 meters. The All-America honor is the second in Patrick’s career as he also placed eighth in the shot put at last year’s NCAA Division III Outdoor National Championship Meet. His throw today bettered his previous school-record throw of 54’6.75” when he won an individual title at this winter’s Ohio Athletic Conference Indoor Championship Meet by five and three-quarter inches. In addition, junior pentathlete Emily Oliver (Waynesburg/Sandy Valley) placed 15th in the five-event pentathlon which includes the 55-meter hurdles, high jump, long jump, shot put and 10th in the 800-meter run. She scored 3,011 points and placed seventh in the 55 hurdles in 8.97 seconds, was 16th in the high jump with a leap of 4’11.5”, placed 10th in the shot put with a throw of 30’10.25”, placed 17th in the long jump with a leap of 14’10.5” and was 10th in the 800 meters in 2:31.49. Yesterday, junior Kevin Phipps (Pataskala/ Watkins Memorial) earned his second Division III All-American award when he placed seventh in the 35-pound weight throw with a toss of 60’1.75”. Phipps also earned All-America status in the discus at last spring’s outdoor meet. The Yellow Jacket winter season is now complete. The 2010 outdoor season also began this week with the rest of the team competing yesterday and today at the Coastal Carolina University Meet in Conway, South Carolina. Next Friday and Saturday, B-W competes at the University of North Carolina Charlotte with competition beginning each day at 11:00 a.m.
U.S. Under-20 Women’s National Team head coach Jill Ellis has called in 24 players for a training camp in Gainesville, Fla., from March 14-21 that will feature matches against two Women’s Professional Soccer (WPS) clubs. One who will be with the squad is Maryland midfielder Danielle Hubka, who led Strongsville High to the state's final four three out of four years from 2005-2008. Hubka is listed on the national team's roster as a defender. Ellis will be without several regulars due to school commitments, but will give a look to several new players as she continues to formulate a roster that will take part in the 2010 FIFA U-20 Women’s World Cup this summer in Germany. The U.S. U-20s will face the host University of Florida on Monday, March 15 at 5:30 p.m. and take on the Boston Breakers on Wednesday, March 17 at 3 p.m. Both of those matches will take place at UF. The U.S. U-20s will finish the schedule of scrimmages against the Atlanta Beat at Flagler College on Friday, March 19 at 7 p.m.
Oberlin, Ohio – The Oberlin College men’s tennis team, back in action this afternoon after a week of rest, defeated visiting Washington and Jefferson College 9-0 in John W. Heisman Field House. 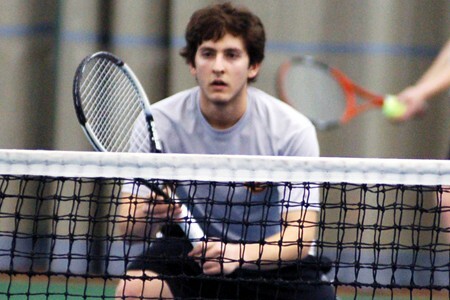 The Yeomen cruised through doubles action earning easy wins in all three spots. Eliot Heaton and Peder Davis stepped into replace OC’s top duo of Ben Godlove and Ben Turchin who were absent from the line up today and earned an 8-2 win over the Presidents’ Christopher Faulk and Brice Manin. Joe Leffler and Sam Towne snapped a three match skid in the second slot defeating Eric Sillard and Cameron Sell, 8-3. Sergio Sanchez and William Broderick, working together for the first time since September, bested Washington and Jefferson’s third pairing 8-0. The Yeomen continued to dominate through singles action, only one Oberlin netter dropped more than four games in their two sets. Sanchez, a senior from Autsin, Texas hitting in the No. 5 spot, earned his first win of the season defeating Sell 6-0 in the first set before Sell retired in the second. The Presidents’ Justin Mondonk was no match for Broderick at No. 6, the Yeomen won in straights sets 6-0, 6-0. Today’s top Yeomen, Heaton, had little to do in his match as Faulk would retire with the first set at 3-1 in favor of the OC No. 1. Oberlin (3-7) would earn nice wins at the No. 2, 3, 4 positions. Towne shutdown Manin 6-1, 6-4; Leffler earned a 6-2, 6-1 win over David Dubois; andPeder Davis cruised to identical straight set wins over Sillard, 6-1, 6-1. “We are looking to continue to improve with our match against B-W and then our spring trip to Hilton Head, S. C. before we get into conference play,” commented Shoemaker. The Oberlin College men’s tennis squad is back in action next Saturday, March 20 when they entertain Baldwin-Wallace College at 10:00 a.m. in John W. Heisman Field House. Danville, Ky. – The Oberlin College softball team traveled to Kentucky this weekend to take part in the March Mayhem Tournament hosted by Centre College. The team began their season with games versus Maryville College and Centre College. In the opener Oberlin would generate a bit of offense before falling 13-5 to the Scots of Maryville. Julia Chauvin, a senior from Hillsborough, N.C., wasted little time in making her impact on the game today as she drilled a two-run shot on her first at bat of the day. This was Chauvin’s eighth round-tripper of her career. The Yeowomen squared off against the hosts in their second game of the evening. 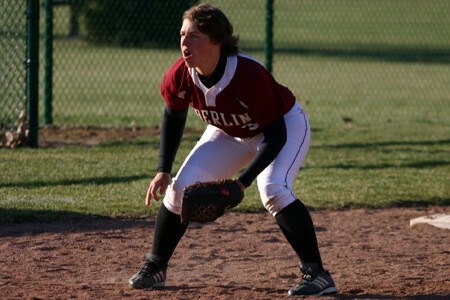 The Colonels earned their fifth win of the early season defeating Oberlin 11-3. Shortstop Kristine Kuchta found her swing as she connected on 4 of 7 at bats on the day. The sophomore shortstop led the Yeowomen a season ago with a .343 batting average. Oberlin (0-2) will continue play tomorrow in the Mayhem Tournament when the face Depauw University at noon before getting a second chance against host Centre College in action slated for 1:30 p.m.